It was an outing from work and this restaurant was chosen to fit with all the different dietary commitments. It serves a South Indian menu and many reviews discuss how good the food is and how uncomfortable the chairs are. On our visit we were very involved in the conversation and didn’t notice the comfort. Within the five people we had a couple of keen “foodies” and a couple of pretty accomplished chefs, so this was a definite test of the food. But you will need to wait for our final judgement.The menu is divided into starters, main meals (thalis and large curries) and side dishes. There were five of us so we shared the starters. We ordered vegetarian street snacks which was a mixture of mysore bonda (spicy potato balls fried in chick pea batter) and parippu vadai (ground chana dal with ginger, curry leaf + green chilli shaped into patties + fried), some broccoli, paneer + chestnut tikkis (pan fried patties spiced with fennel + cumin) with chutney and chestnuts. rabbit fry + pathiri (rabbit pieces in chilli, ginger, garlic, black pepper and coconut milk) serviced with light rice flour pancakes and finally there was a sweet and savoury banana bhaji (sweet banana bhaji gluten + green banana bhaji / red onion chutney + peanut chutney). I think we liked them all but not quite equally. I think the rabbit was an overall favourite and mine was the broccoli and paneer. Then on to the mains. 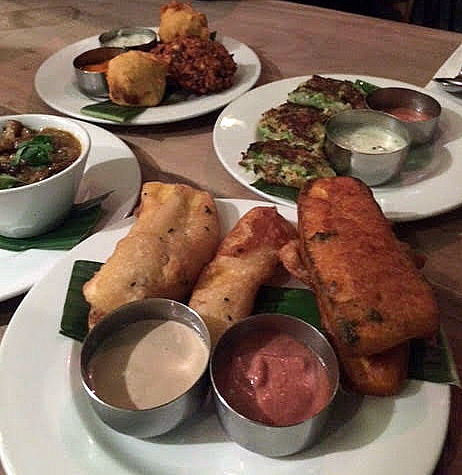 There was a fish thali, a chicken thali, a winter dosa (filled with a spiced masala of parsnip, beetroot and chilli served with chutney), a couple of Vadakara chicken curries (masala of coconut, sesame, green chilli, tomato and sesame seeds). 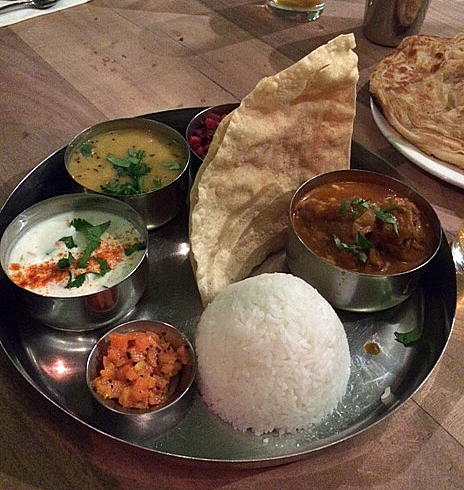 There were no complaints about the thalis – the plates were clean and they were pronounced delicious. The winter dosa was huge and a bit too big to finish, even though as a dosa enthusiast I tried to help out. The Vadakara chicken curry is relatively mild but really flavourful, with the chili creeping up ever so slowly to a great warming feel. The only negative comment from this highly critical group was that they could improve the coconut chutney, which wasn’t as fresh as it could have been. I wouldn’t have noticed as every course was intriguing. We drank beers, a mango lassi (very sweet) and water and the bill came to £119.25. We were impressed and I for one will be revisiting soon, but we will make sure we book as it is small and popular.